Designed for professional kitchens, this All-Clad LTD Stockpot is ideal for preparing large quantities of soup, chili or stews. With aluminum core that’s bonded between a polished stainless-steel interior and an anodized-aluminum exterior, heat is absorbed and distributed quickly and evenly. Tight-fitting lid will keep moisture in and intensify flavors. 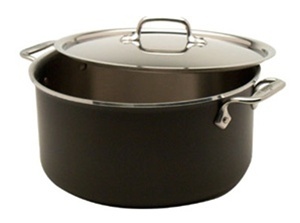 Stainless-steel handles are riveted for superior comfort and durability.10 1/2 x 5 5/16" 3QT LTD 3-PLY Bonded Construction Stock Pot with Lid. LTD Cookware makes a brilliant statement of sophisticated design backed by rugged, functional performance. Its highly-polished stainless steel cooking surface is durable and easily maintained. Offers a blend of the best qualities of each of the metals comprising it. Doesn't react with acid foods. Choice of utensils may be used. Durable enough to last a lifetime. Extends the full depth of the utensil. Guaranteed not to peel, chip or scratch. A look preferred by many cooks. Solid Cast Stainless Handles / with stainless steel rivets. Permantently attached / won't get loose. Feels great in your hand. All handles have holes for hanging on potracks. Tight fit locks in flavor and heat. Assures a lifetime investment for generations of fine cooking.